The sun is the perfect example of acting without desire. When the sun rises does the idea enter its mind to say, 'I shall banish the darkness, I shall urge the birds to fly, and I will set people working'? No, the sun always stays still, and yet its stillness makes the world go around. Even when we have night, the sun acts and shines on the other side of the Earth. The sun shines all the time, and yet no one notices that it is working. The sun sets everyone to act. It makes cows graze, birds sing, merchants open their shops, farmers plow their fields, and yet if someone does not wake up and draw the curtains, the sun will not force them to do so. It is enough that it exists. The sun is the perfect state of being rather than doing. The sun does not have light; it is light. The sun does not do good; it is good. Vinoba Bhave was Gandhi's spiritual successor in India. More about him in King of Kindness. Seed questions for reflection: How do you relate to the metaphor of the Sun as a perfect state of being rather than doing? Can you share a personal story of a time you were being rather than doing? How do you reconcile a beingness that holds the space neutrally with being moved by love? The Sun is that bright light within my soul. My ability to live in The Present Moment. To appreciate nature and all humans for who they are and their circumstances of life. The Sun represents warmth, love and tenderness. I don't always have a Sun experience, quite often i only experience the grey or even dark clouds but as i become quiet and find my center...The Sun becomes the light and warmth of my soul. I relate Sun to the human Soul as Sunny. It is the eternal Light and the mystic Sound of our being.Our being is inside,innate & an inner-net. Its a natural agent ever shining illumination and glowing brightness.It energizes and stimulates the real sight of "Who Am I" enlightening the whole thing clear and visible to the third eye effortlessly. Personally I surrender, submerge into this original source eliminating the duality. The reality dawns. "Shivohum Shivohum ShivSwaroopohum.Nityohum-Shudhohum-Budhohum-Muktohum. ChidAnand roopah". Its neutral joy-Love- affection-compassion, sympathy & empathy for every one-every time-every where-everything. Just what I needed to hear. I've been going to protest marches, not to protest, but to get protest footages to make a video to highlight a song I wrote called, I Believe In Love. Every time I attend one of these marches, I feel like a Sneak because I know the intention of all these people who worked so hard to create the protests is to gather more and more people who would support them in ending the political agenda that is ruling America at this point. During the event, many of the participants came to me to welcome me and to tell me of their agenda so I could participate. At the end of the event, someone approached me to get my contact information. At that point, I had to tell him that I don't believe in protests, because, protests only create more protest and the only reason I came was to get some protest footage so I can make a video with I Believe in Love in the background. Then I sang some of the song to him. Instead of calling me a fake protester sneak, just using his group, he told me that he really liked my song and would like a copy to show the whole group and that I Believe In Love is exactly what the group needs. I was totally flabbergasted by his reaction. I couldn't believe that instead of telling me off about using their efforts, he was actually telling me that my song was exactly what their group needed. As I got such a loving reception from that man trying to get me to join them, I thought, maybe I am supposed to join them. I've been asking the Universe to be in a community of like-minded people to create with. Instead of trying to find the perfect group, maybe it's learning to love unconditionally this group and in doing so, we can resolve the unresolved issues of our world. On one hand, I felt so elated by this happening, on the other hand, how am I going to change their rhetoric of how much they would like to squash the leaders of this government to unconditional love? Maybe it's in emulating the sun. Focus on the love that you are and trust. Thank you, Gregg. It is an interesting idea and philosophy of the how the sun exists, yet we actually really don't know....sorry to pull away from the intentions of the writer. But I love how these small, and often limited, beings (called humans), can attempt to express understanding of something so much grander and something that may be incomprehensible. I think that for the sun, being and doing are synonymous, and the same could be said for us. If we define being as the state of balance where we are truly ourselves, then we do radiate an energy as the sun does. 'Holding the space neutrally with being moved by love' is something we all have the capacity to do. When we achieve that balance we do hold love as that is our natural state of being when not influenced by everything going on around ourselves. 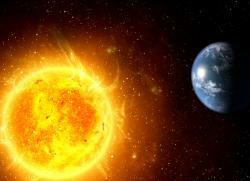 We are, each of us, very like the sun, sharing our warmth and caring with the Universe. I can relate to this beingness ... experienced sometime, but then ... ? Actually, the sun never stays still -- it is constantly moving and changing. It doesn't make cows graze or birds sing. It's simply being what it is and doing what it does, giving heat and light from which many living beings and nonliving things benefit, and it does all this with no desire or intent. The sun is neutral and detached. Being and doing can be natural and authentic, not goal directed or manipulative. When I am being or doing in a natural and authentic way, I am without intent, not trying to control or make anything happen, simply being and doing because it is my right action. When I am this way I am neutral, detached from purpose or outcome, and I am moved by love since that way of being is love. The sun as I understand represents the inner being which always shines within us.The light of being is our true nature described as the Divine Light within us. Such light is ever shining and is everywhere.Rabindranath Tagore poetically describes that light in these words:" Light, my light, the world-filling light, the eye-kissing light. heart-sweetening light! Ah, the light dances, my darling, at the center of my life: the light strikes, my darling, the chords of my love; the sky opens, the wind runs wild, laughter passes over the earth. The butterflies spread their sails on the sea of light. Lilies and jasmines surge up on the crest of the waves of light...Mirth spreads from leaf to leaf, my darling, and gladdens without measure. The heaven's river has drowned its banks and the flood of joy is abroad." I experience such light within me when I am quiet within me. The quiet of non-doing moments opes, expands and deepens my awareness of the ever-flowing and ever present stream of pure consciousness. It is filled with peace, joy, love, fulfillment and fullness. I also experience this state of consciousness when I am fully absorbed in doing what is deeply meaningful to me. At such times my doing is not separate from my being.. It is like the light is the sun and the sun is the light.. It happens when I read something that moves and fills my heart like Tagore's poem I mentioned before. The sun light for me is a call for awakening of my mind and heart. It is like living from within. May we awaken to receive the blessings from the ever-shining and ever-enlightening hands of the sun!